I just made a booking - will I get a confirmation email? 1) A confirmation email: showing the trip details confirmed by the booker. 2a) An Itinerary email: this email is sent to the traveler after the ticket is issued for a flight or train. This document is considered an "e-ticket" by airlines, contains detail about your itinerary, and lists a contact phone and email to reach Rydoo travel agents that can address any issues regarding this specific ticket. 2b) Hotel voucher email: the hotel voucher document can be presented to the hotel receptionist upon check-in. Listed in the hotel voucher, includes all necessary details regarding your reservation, proof of payment, and contact information if you need to speak with a Rydoo travel agent regarding this specific reservation. You can also find this hotel voucher from the Rydoo web or mobile app. Simply go to your bookings and view the details of the booking. 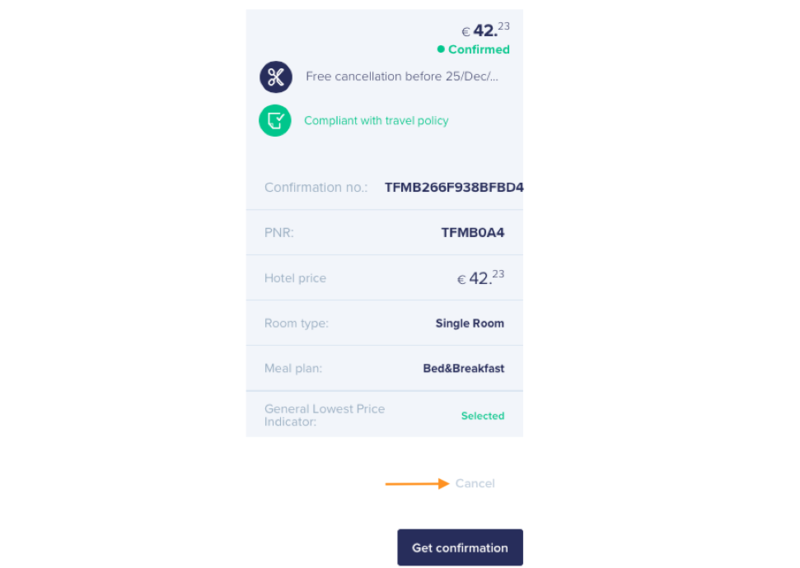 To get the confirmation voucher, click on the “Get Confirmation” button in the app..
How do I change or cancel my refundable hotel booking? For refundable hotel bookings, you can easily cancel your booking in our web platform. From the travel module, click on the hotel booking you wish to cancel and view the details. On the bottom right corner, you’ll find the cancel button just above the “Get confirmation” button. How do I change or cancel my flex airline ticket? Flight booking amendments must be done offline through a Rydoo agent by contacting the number or email listed in your itinerary. Please be aware that there is a 20 Euro charge for any offline action. Ticket rebooking and cancellations are subject to the airline's policy. Please refer to your ticket confirmation voucher for the re-booking and cancellation conditions. To process your request, we will ask you to provide the following information: airline ticket number, PNR reference, company name, family name, email address and mobile phone number. The hours of operations for Rydoo agents are M-F 8:30am-6:00pm CET. My flight is cancelled - what should I do? If your flight has been canceled, and we are made aware early enough, will contact you, if not the airline will contact you as soon as possible. Please make sure that you have filled out the contact details in your profile before making your booking. To speak with a Rydoo agent, contact the dedicated number or email listed in your itinerary. Who do I contact if I will arrive late at the hotel? Please notify the hotel reception directly as soon as you know you will arrive late at the hotel. You can find contact details from the Rydoo app. Can’t find the answer in this help center? 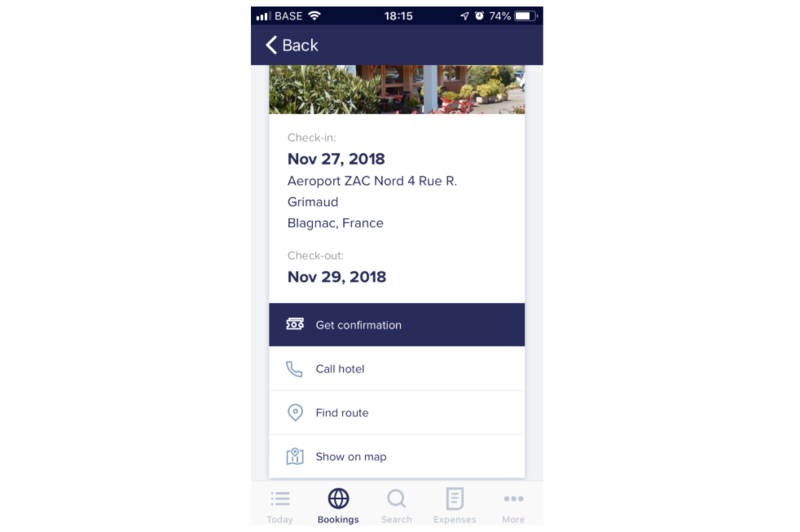 Questions regarding a specific reservation made on Rydoo should be asked to the dedicated number and email listed in your itinerary or hotel voucher. From there, the right Rydoo travel agent will be able to help support issues relating to your specific ticket. The hours of operations for Rydoo Agents are Monday through Friday from 8:30am-6:00pm CET. Please note that charges may be applied to any modification of your reservation. For all other questions, please contact us a through the chat on the bottom right corner.